Location: Giant Screen Theater · Peoria Riverfront Museum · 222 S.W. Washington St. · Peoria, Ill.
PEORIA, Ill. – Leading Peoria doctors representing Peoria’s major medical institutions will speak on medical innovation during an unprecedented gathering for the panel discussion “What is the Future of Medicine?” Thursday, March 28, 6 p.m. at Peoria Riverfront Museum’s Giant Screen Theater. The event, followed by a reception with light refreshments, is free and open to the public. Among the topics covered will be genomics and artificial intelligence in medicine, telemedicine hubs, tissue engineering and organ transplantation, high-tech limb replacements that interface with the nervous system, surgical robots and future technology currently in development. 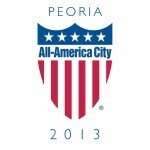 Many of these innovations are happening right here in Peoria. The panelists include pediatric cardiologist Dr. Matt Bramlet, director, congenital cardiac MRI, OSF Children’s Hospital of Illinois and lead investigator for advanced imaging and modeling, Jump Simulation Center; Professor Emeritus Dr. Patrick Elwood, University of Illinois College of Medicine Peoria, Department of Neurosurgery; Dr. Keith Knepp, president, UnityPoint Health - Methodist and Proctor and UnityPoint Clinic - Peoria, ProHealth Medical Group; Dr. James McGee, radiation oncologist, OSF HealthCare; Dr. Rick Pearl, director of surgical simulation, Jump Simulation Center; Dr. John Vozenilek, vice president and chief medical officer and professor of medicine and engineering, Jump Simulation Center. The panel will be moderated by Dr. Sarah Zallek, neurology, pediatrics, OSF HealthCare and Peoria Riverfront Museum board member. The event coincides with museum’s “Year of Invention” theme and is part of the programming for the “10 Medical Inventions That Changed the World” exhibition, through April 28. For the exhibition the museum collaborated with prestigious organizations including the Mayo Clinic, University of Illinois College of Medicine, Colonial Williamsburg, Varian Medical Systems, Jump Trading Simulation Center, Illinois State Museum and the National Center for Agricultural Utilization Research. The exhibition is sponsored by OSF HealthCare, UnityPoint Health, Jay & Betty Vonachen and the Visionary Society.